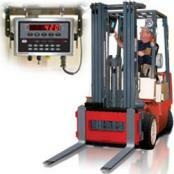 Fork lift scales allow you to take the scale with you throughout the warehouse. A forklift scale allows the integration of weighing and data management into your operation – without adding any extra steps or route changes. This means you protect your revenue while maximizing efficiency. All Avery Weigh-Tronix forklift scales are mounted directly on the front of the forklift truck carriage, with a weight indicator in the cab of the truck. This arrangement allows the driver to clearly, easily and safely operate the scale system without interrupting their normal routine. The AWTX fork lift scales available from Central Carolina Scale are built with the tough warehouse and material handling environment in mind. The patented design features two metal plates coupled together with Weigh Bar weight sensors, which means no springs, hydraulics or flexures that can be easily damaged. Furthermore, the system monitors the orientation of the scale and maintains accurate weight readings even if the forklift truck is on unlevel ground, the mast is tilted, or the pallet load is o­ff center. 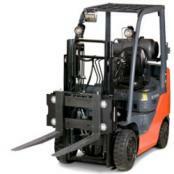 Meanwhile, you can keep your product moving with Rice Lake's CLS Cargo Lift Scale. 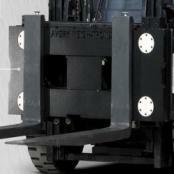 The CLS mounts directly to any class II or III lift truck, saving material handling processes time and money. The indicator easily installs using either wired and wireless methods. The CLS-920 model comes with the added diagnostic and programmable features of Rice Lake's powerful 920i indicator. The UK's leading distribution specialist, provides cost-effective, reliable pallet distribution to thousands of businesses and customer addresses every day. Using a network of hauliers and strategically placed hubs around the UK, the company delivers the highest levels of service with industry leading innovation. With safe operation at the forefront of their strategy, the need for safe loading and transportation of goods without affecting the speed, efficiency, or cost of pallet delivery, is paramount. Recently, the company fitted 28 Avery Weigh-Tronix Forklift Truck Scales to a fleet of new Still forklifts at their central Hub. 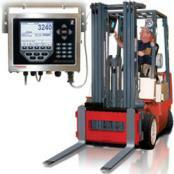 The scales allow Forklift operators to lift and weigh loads in one go. This streamlined process gives the operator the information needed to ensure safe positioning of the load on the upper or lower deck of the trailer. The key objective is to ensure the customer adhere to the RHA guidance that states no items over 400kg should be loaded on the top deck of a double deck trailer, as it could lead to uneven or unbalanced loads. Before investing in the forklift weighing system, the customer would either use customer declared weights on packages, which are often an educated guess, or make repeat visits to a stationary industrial floor scale to check the weight of goods. Through several trials and investigations this was the only system the customer could find which gave an accurate weight during operation at the lowest tolerance. One of the managers determined that repeatedly using a floor scale was time consuming. Each time they had to bring the freight to the scale, stop to weigh it and then pick it up again. Where as a forklift scale allows the customer to weigh and lift in one step, while also keeping a running total of all weights. The forklift scales are mounted directly on the front of the forklift truck carriage, with a weight indicator in the cab of the truck. This arrangement allows the driver to clearly, easily and safely operate the scale system without interrupting their normal routine. Drivers can now lift, weigh, move and record a pallet in one operation, without additional steps. Avery Weigh-Tronix fork lift scales are built with the tough warehouse and material handling environment in mind. The design features two metal plates coupled together with Weigh Bar weight sensors, which means no springs, hydraulics or flexures that can be easily damaged. Furthermore, the system monitors the orientation of the scale and maintains accurate weight readings even if the forklift truck is on un-level ground, the mast is tilted, or the pallet load is o­ff center. In addition to safe positioning of loads, the system allows the customer to load vehicles to maximum capacity while staying compliant with GVW and axle weight requirements. As well as being a criminal offense which can attract fines and prosecution, unsafe loading can have a detrimental impact on the road worthiness of vehicles – from braking systems to increased instability and wear and tear. With a network of thousands of vehicles, the potential cost of unsafe loading is huge.